A school for creatures of the night opens its doors – do come in! 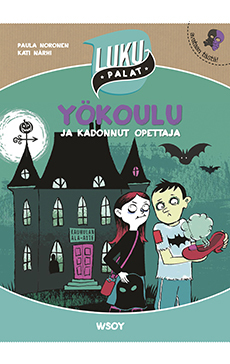 Paavo and Martta decide to investigate the mystery of their missing teacher. They find one of their teacher’s beloved smelly shoes behind the classroom door. Will it lead them down the right path? Night School and the Missing Teacher is a humorous, fast-paced adventure for all fans of strange phenomena. Even the school is unique, with its student body made up of zombies, vampires and other creatures of the dark. Night School and the Missing Teacher is published within our new “easy-to-read” series called “Bite-sized Stories” and there should be more Night School books in the future!